Tim Murphy is a legend among riflemen — a Frontier Partisan sharpshooter who, deploying his long rifle on October 7, 1777, turned the tide of the American Revolution. 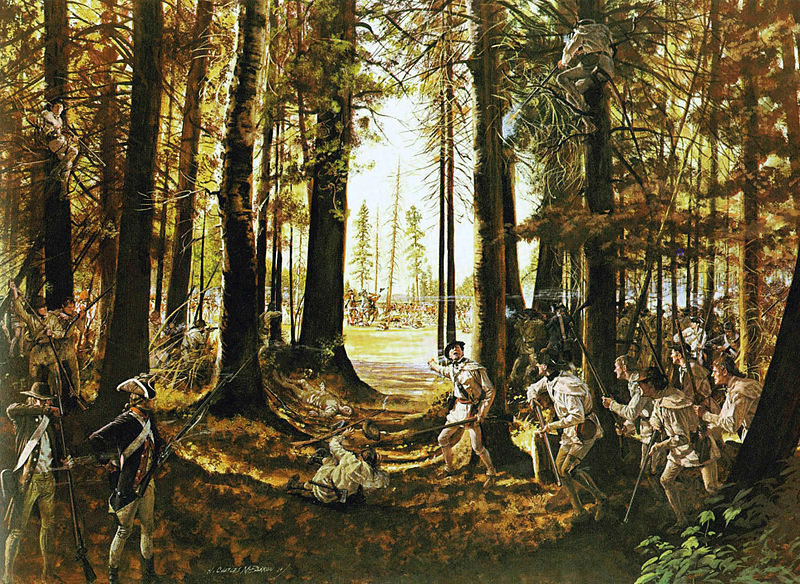 According to folklore that has accreted over a couple of centuries, Murphy — under direct orders from Colonel Daniel Morgan — climbed a tree during a heavy firefight at Bemis Heights (New York) and picked off British General Simon Fraser as he was rallying his troops at a critical moment in the Second Battle of Saratoga. Fraser’s death turned the tide of battle; the Americans soon took the surrender of General John Burgoyne; the French agreed to enter the war, an alliance that would, in 1781, prove decisive in winning American independence. You could argue that Tim Murphy’s shot won the American Revolution for the American Patriots. Such is the folklore — a tale I cherished from the sixth grade on. There is, however, nothing that proves that Murphy actually fired that fatal shot. There is no argument over whether Murphy could have made the shot. Tim Murphy was a badass. He was born in 1751 out of Irish heritage traced back to Donegal. At the outbreak of armed hostilities, he was living in the Wyoming Valley, bordering Seneca territory on the Pennsylvania frontier. He and his brother John enlisted in Captain John Lowdon’s Company of the Northumberland County Riflemen. The riflemen harried British pickets during the siege of Boston in 1775, got pushed off Long Island with the rest of George Washington’s army, and participated in the near-miraculous victories at Trenton and Princeton that kept Washington’s army alive at the end of 1776. In July 1777, Murphy was one of 500 riflemen hand-picked by Col. Morgan to serve in a dedicated rifle corps in the campaign to stop General Burgoyne’s invasion of the colonies down the Hudson River from Canada. 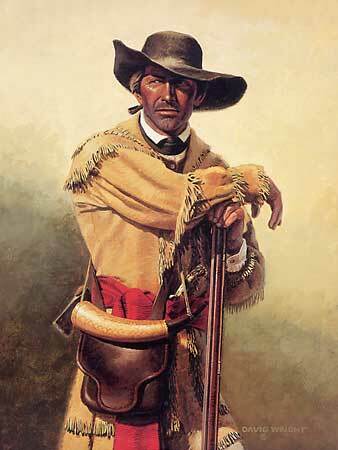 American Rifleman by David Wright. The standard arm of the day was the smoothbore musket. Both sides relied on the .75-caliber Brown Bess, a stalwart, soldier-proof warhorse. The smoothbore could be reasonably accurate at 50 yards; beyond that, the wobbly projectile couldn’t be relied upon. And the weapon had no sights — just a bayonet lug at the muzzle that served as a kind of shotgun bead. It was a weapon suited for massed volley fire and to mount a bayonet. In comparison, the American long rifle, which had evolved out of the German Jaeger rifle, was a marvel of accuracy. It had fixed iron sights. It was rifled, which stabilized the projectile. The rifles of the era were of much smaller caliber than the musket — .40 to .54 or so — and they were loaded with a patched round ball. The greased patch made for smooth loading and formed a gas seal that improved velocity and consistency. 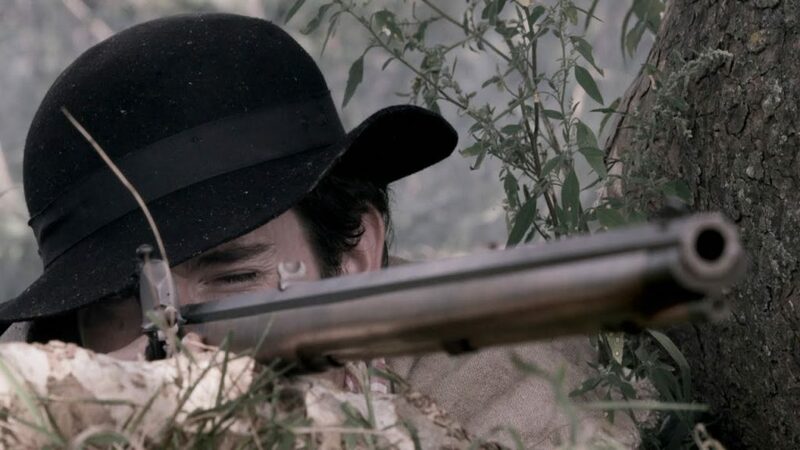 That’s damn good extreme long range shooting, and since Tim Murphy was among Morgan’s 500 chosen men, he was certainly capable of delivering it. The disadvantage of the rifle was that it was comparatively slow to load and could not mount a bayonet. To be effective, riflemen had to be supported by musket-armed light infantry who could keep up a volume of fire and defend against a bayonet charge. Here’s what we know for sure about Murphy and the battlefield death of Brigadier General Simon Fraser: Murphy was part of Morgan’s rifle corps and he was a capable marksman. Fraser was a conspicuous target on horseback, rallying his troops (mainly comprised of German Hessian mercenaries) in the heat of a hard-fought battle. It seems clear that Fraser was singled out by General Benedict Arnold (this was before he turned his coat) and Col. Morgan to be targeted by rifle fire. Shots hit the crupper of Fraser’s saddle and parted his horse’s mane before a ball took him in the belly. He slumped in the saddle and was escorted by an aide off the field of battle. He died later that night. The elimination of Fraser did seem to throw the hard-pressed British troops into disarray and contributed to Burgoyne’s defeat. The only sources that single out Murphy as the marksman who killed Fraser are from many decades after the events, and as is often the case when folklore becomes history, a story is repeated as “fact,” and embellished with the telling. Hugh T. Harrington picks apart the sourcing on the Murphy story in detail in The Journal of the American Revolution and in even greater detail in The Journal of Military History. Worth the time to read one or the other. Other aspects of Murphy’s purported feat have grown in the telling. He was supposed to have been armed with a Golcher double rifle, enabling him to fire shots in quick succession. This is almost certainly not the case. Murphy appears to have owned a Golcher later in his life, when he was a farmer in the Mohawk Valley, but this would have been in the 1790s at the earliest and probably in the early 19th century. That tracks with Golcher’s career. Murphy was almost certainly armed with a conventional long rifle at Saratoga. The distance of the kill shot has been stretched to absurd lengths. I spent many years shooting flintlock long rifles, and I can assure you that, given roundball ballistics and fixed iron sights, shots over 200 yards get complicated. Harrington thoroughly describes the ballistic problems with the notion that Murphy shot Fraser at a quarter-mile (440 yards). For the sake of space, let’s just stipulate that a 28-foot holdover on a moving target, to say nothing of wind-drift is… absurd. Matoon’s old man allegedly fired on Fraser from 66 yards (why so precise a figure I do not know). If Murphy did shoot Fraser, the range was closer to that than to a quarter-mile. Murphy could have made the kill shot on Fraser. Maybe he did. We just can’t know. It’s safe to assert that General Fraser was killed by aimed rifle fire from Morgan’s men, and that his death was decisive. More than that is folklore. It doesn’t diminish Tim Murphy a bit to let the Saratoga shot-heard-round-the-world story go. He was a real deal Frontier Partisan warrior, and his actions on the Mohawk Valley frontier during the years after Saratoga are enough to bring honor upon his name. We’ll take that story up in Part II. Thanks Matthew. Always appreciate your interest. That’s what I love about the blur of myth, folklore, and history. They all make for good stories. In September of 1777 on Brandywine Creek in Pennsylvania, British Major Patrick Ferguson claimed to have had a similar opportunity to change the course of the war. He had a clear shot at a colonial officer on horseback. “I could have lodged half a dozen balls in or about him, before he was out of my reach,” Ferguson recalled, “but it was not pleasant to fire at the back of an unoffending individual, who was acquitting himself very coolly of his duty—so I let him alone.” He later learned the officer was most likely George Wahington. Ferguson improved upon an earlier design of breach loading flintlock that would have allowed sharpshooters to remain prone or kneeling while reloading, but the British army wasn’t forward thinking enough to adopt the “Ferguson rifle.” It might have altered the course of the war. He died leading British troops at the Battle of Kings Mountain in South Carolina. That’s one of those real historical what-ifs that make the hair on the back of the neck stand up. This brings to mind the death of Gen John Reynolds at the hands of a Confederate sniper on the first day of the Battle of Gettysburg. Snipers can make a great deal of change through fear, and intimidation. I personally like Chris Kyle – 150 dead jihadis makes for great stories. Then there’s Union General John Sedgwick at the Battle of Spotsylvania Courthouse whose famous last words were “They couldn’t hit an elephant at this distance,” as a Confederate sniper armed with a Whitworth Rifle killed him. I’ve heard Sedgwick’s actual last words were something more mundane (likely orders to his subordinates), that said I believe he did say they could not hit an elephent. Another case where definitively separating folklore from fact is not really possible. He was, however, definitively shot with one o’ them weird, long, hexagonal Whitworth bullets. The funny thing is that Sedgwick is often portrayed as an idiot. In reality, the guy was a seasoned leader with a decades of military experience—but THAT’S what got him killed. For his entire career the effective range of small arms was almost the same as in Tim Murphy’s day. A headshot at 900+ yards was probably unfathomable. There’s no one like Billy Sing ! And by the way, new Bob Lee Swagger: “Game Of Snipers” this July. When Bob Lee Swagger is approached by a woman who lost a son to war and has spent the years since risking all that she has to find the sniper who pulled the trigger, he knows right away he’ll do everything in his power to help her. But what begins as a favor becomes an obsession, and soon Swagger is back in the action, teaming up with the Mossad, the FBI, and local American law enforcement as he tracks a sniper who is his own equal…and attempts to decipher that assassin’s ultimate target before it’s too late. shoulder, the spotter none other than Ion L. Idriess. back only to get shot and killed by someone behind him………..no entry wound could be found! The blur……. tis where we live! Off topic, but there is going to be a new Tolkien bio pic that deals with his time in the First World War. Interesting. I’ll surely see it.